Ikea’s dangerous dressers are still on sale in Europe. Consumer Product Safety Commission employees watch as a 28-pound dummy falls over and under Ikea’s Malm model chest of drawers. Two weeks after recalling 29 million pieces of furniture in America and Canada, Ikea has agreed to extend that recall to China. 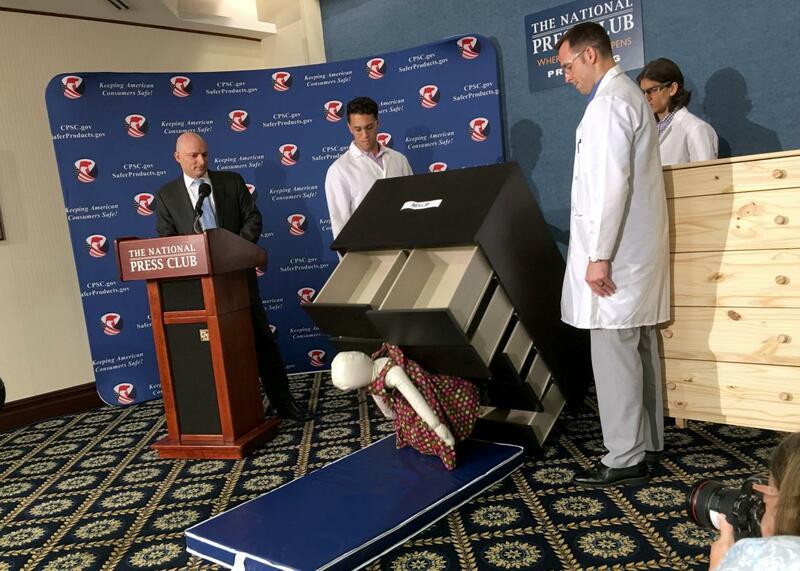 The Swedish company announced the American recall after the deaths of at least six toddlers, cases where the near-ubiquitous Malm and other models of chests and drawers toppled over and fell onto children. Although those same items are sold in Europe and China, the company did not initially recall them as they did in the American market. And it only expanded its voluntary recall to China after intense consumer pressure to do so. Why are the dressers dangerous? According to the U.S. Consumer Product Safety Commission, the dressers aren’t safe unless they’re attached to the wall. A child who stands on the bottom drawer while trying to reach the top of the dresser could have the entire unit tumble over onto them. Ikea USA president Lars Petersson has told reporters that the chests and dressers were sold with instructions saying they must be mounted to walls, but, given the number of deaths, it’s clear that the units were not mounted. After much criticism from the Consumers’ Association of China’s Nanjing City, the official Xinhua news agency, and Chinese social media users, Ikea has agreed to recall 1.7 million chests and dressers in China. As company spokeswoman Xian Jiaxin said in an interview, “Ikea is a very responsible company, consumer safety is very important to us, which is how we came to this decision.” Maybe so—but why, then, are the dressers still on sale in Europe? In that same interview, Xian Jiaxin said that the dressers would still be available to European shoppers. Ikea, of course, is still free to sell its dressers wherever it wants. Its American recall never acknowledged that the dressers were unsafe, only that they did not meet U.S. standards for safety. And in China, too, the company isn’t being forced to recall the furniture but is responding to consumer outrage. At the end of the 2015 fiscal year, Ikea’s China’s sales totaled about $1.55 billion, a massive sum that gives Chinese consumers a great deal of sway over Ikea’s fortunes. And those customers are pissed: Some called the company’s reluctance to issue a recall “arrogant” while others said, “The sooner they close down the better! Let’s boycott Ikea now!” On March 15, China’s Consumers Rights Day, the country’s national television broadcaster accuses major companies of violating consumer interests. With growing concern over consumer safety, and with the massive influences that this large market wields, it is clear why it would behoove a company like Ikea to heed the calls of its consumers and extend its recall. It’s too bad the concerns of shoppers in Europe haven’t convinced the company to take action there, too. But Ikea’s recall evidently isn’t about quality assurance. It’s about saving face and preserving profits. Hopefully that will be enough to convince Ikea to do right by its customers everywhere.